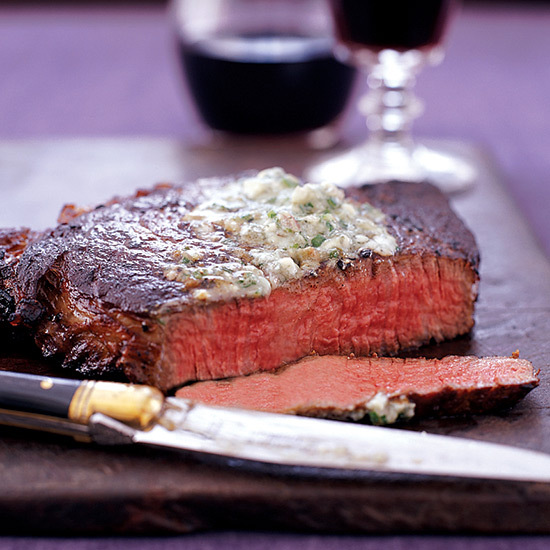 Here, F&W's Ray Isle discovers the best wines for juicy steaks. Summer is done, grilling season is over, life is meaningless, and really, why not just eat lettuce from now on? That was how I was feeling recently, confronted with the sudden awareness of shrinking daylight hours and the first hints of cool weather in the air (note: I live in the Northeast). But then, optimist that I am, I thought, what the heck, I’ll cook my steaks inside. And, of course, open some good wine. 1. Let the steak get to room temperature before you cook it. This keeps the meat from “seizing”—the proteins tightening up, leading to a tough steak. 2. Preheat your pan or griddle to 400 degrees. If you don’t have a laser thermometer (evidently something executive chefs have; I, like any regular human, do not own one), test the pan by placing a piece of fat on it. It should sizzle and start caramelizing. 3. On a stovetop, don’t attempt cuts thicker than one inch. If big ol’ Flintstone steaks are your dream, then sear the steak on the stovetop and finish it in a preheated oven. 4. With good beef, salt and pepper are all you really need. And a light coating of olive or canola oil. 5. After cooking, let the steak rest for three to five minutes on a perforated surface, like a cooling rack on a pan or even crumpled-up aluminum foil. You don’t want the steak to sit in its juices, because that might lessen the glory of that seared crust you just achieved. Then, of course, eat the dang thing. What all of these choices share are a substantial tannic structure, reasonably high acidity (perhaps somewhat less so for the Napa wine) and a balance of savory and fruity flavors. This all makes sense: One reason biting into a juicy piece of beef is so pleasurable is the fat content (very few people ask for a dried-out, super-lean steak, and for good reason). Tannins—which can give big red wines an astringent, tongue-drying, raspy quality—do two things in your mouth: they bind with proteins, and their astringent character balances out all that rich fat. Acidity, similarly, refreshes your palate after a bite of something fatty; that’s one reason that super-fruity, low-acid reds actually aren’t all that great with a steak, sort of the way Welch’s grape juice wouldn’t be. Unfortunately, not everyone can afford (or can raid their restaurant’s cellars for) top northern Rhône reds, superstar Brunellos or long-cellared American Cabernets. But, conveniently, all of these regions offer more affordable alternatives. Here are a few: all, also, out-of-control great with a juicy steak. 2010 E. Guigal Côtes du Rhône ($13) Most Côtes du Rhône is based on Grenache, but Guigal, known for its great Côte-Rôties, focuses much more on Syrah. This spicy, inky red definitely hews to the northern Rhône style. 2012 Château de Saint Cosme Côtes du Rhône ($15) Another nearly 100 percent Syrah wine from this usually Grenache-based appellation, Saint Cosme’s bottling has a lot of meaty depth and distinct herbal notes. 2012 Louis Martini Sonoma County Cabernet Sauvignon ($20) There’s ripe California fruit here, to be sure, but it’s balanced by classic Cabernet structure and elegance. And—given how much Martini makes of it—this wine is also surprisingly ageable. 2012 Casanova di Neri Rosso di Montalcino ($20) The baby brother, so to speak, to the more famous Brunello di Montalcino, Rosso di Montalcino comes from exactly the same area, and requires less aging before release. Think vivid cherry fruit, firm structure and juicy acidity. 2011 Mastrojanni Rosso di Montalcino ($25) This impressive property, owned by the same family that owns the Illy espresso company, produces top-flight Brunellos, and also this ruby-hued, vivid Rosso.